As the year comes to a close, the time has come for us to perpetuate the annual tradition of making empty promises to ourselves. From weight loss to conquering phobias, to finally finishing your novel; in your heart you know that following through on lofty goals is never as easy as it sounds after a few glasses of bubbly. As a business owner, you know that there’s a lot more riding on the goals you set for your company, and your ability to follow through will yield a much bigger reward than fitting into your skinny jeans. 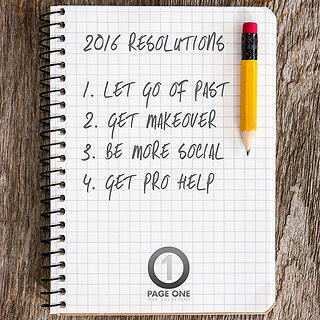 In 2016, why not commit to a few simple web resolutions that have the power to transform the online presence of your business, not only in the New Year, but for years to come. Curious? (yes you are.) Keep reading! While this popular resolution means something different to everyone, when it comes to your website, we’re definitely not talking about blocking your ex’s phone number. In the world of web marketing, progress comes from letting go of what isn’t working and adopting new habits that keep your website (the face of your business) looking shiny, new, and relevant. This catharsis can come from small things like getting a cool new logo and refreshed site design, to streamlining your checkout process or rewriting your content to reflect your company’s new and improved mission statement. Not sure where to start? Call a meeting and have your whole team take a critical look at your company website, accessing it from computers, tablets, and smartphones. Make a list of everyone’s complaints about appearance, functionality, and anything else that seems dated or unnecessary. Start the New Year right by making these changes a priority. When you first paid to have your website designed, whether it was 5, 10, or 15 years ago - it was built to reflect the style and aesthetic of your brand. Even in the unlikely event that nothing has changed in your company since then, your customers needs and internet search methods most assuredly have. These days, not only does most search traffic come from mobile devices, Google will penalize sites that aren’t built to be easily navigable by smartphone or tablet. By investing in a site “makeover” you will not only be making your site more attractive to potential customers, you’ll be demonstrating to anyone who lands on your site that your company is modern, professional, and an industry authority. Above all, a makeover of any sort has the power to internally build confidence, meaning that you’ll be more likely to tell your customers to check out your website. Maybe you’ll even use it as an excuse to have a site launch sale to kick off the New Year with a little extra profit boost. We all have our reasons for resisting social media, especially when it comes to our business. While it’s easy to interact with friends and family on your personal Facebook, Twitter or Linkedin, it’s much more challenging to engage with potential customers and generate professional content on your company’s profile. Part of this challenge comes from the correct assumption that business posts should be un-biased, relevant, and interesting. If you’ve already set up social media accounts for your business, but feel uninspired when it comes to posting content, just think about what your customers expect from you! Simply put, your customers expect you to be the authority in your industry, so it’s your job to find, create, and share the most relevant and interesting pieces of news, industry updates, tips, and insight. You’ll be able to find a lot of this by Googling pertinent topics, but you should also consider adding a blog or news page to your site and writing some of it yourself! Readers will enjoy your point of view and real world perspective on the industry. Most big changes simply can’t be achieved alone, and that’s especially true when it comes to the web presence of your business. When it comes to getting rid of the elements of your website that you no longer need, giving your site a new design, making your website easier to navigate on mobile devices, or getting more involved on social media, it’s a good idea to enlist the help of a professional. Before you ask your neighbor’s college-aged son who “likes computer stuff”, consider that it makes more sense to get it done right by seeking out a web marketing company. When you work with professional web designers, developers, and Search Engine Optimization specialists, you’ll be trusting your site to an industry expert, just as your customers trust you. Working together, you can create an eye-catching and engaging web presence worth celebrating. Cheers and Happy New Year From Page One Web Solutions!